The 52-year-old priest died last week in what the Church described as a “freak accident”. THE FUNERAL MASS of Father John Cummins, who died last Wednesday, has taken place in Newbridge Co, Kildare. It’s understood his car went out of control on the grounds of the parochial house. Father Cummins had been the parish priest of Abbeyleix in Co Laois for eighteen months before his death. His funeral mass took place this afternoon at St Conleth’s Parish Church, Newbridge. During a Requiem Mass on Saturday, Bishop Denis Nulty recalled the evening of John’s death last week as “the longest few hours of a very long month”. “Monsignor Caoimhín, Father Paddy and Father David, our youngest priest, were present that evening when words for all of us were difficult to find. “Not that they are easier now, but time, liturgy and prayer and the person John was, helps all of us through these emotional, heart-wrenching days,” Bishop Nulty said. Father Cummins was Parish Priest in Abbeyleix for eighteen months, having previously served for four years in Naas, five years as Chaplain in the Institute of Technology in Carlow and twelve years in the Cathedral Parish. John graduated from Maynooth in 1991 and pursued further studies in Rome for five years, a path Bishop Nulty said John had no regrets about. John loved being a priest. He gave his life to the Church as a priest. At a time when the Church needs more good priests on the pitch, it feels as if God scored an own goal last Wednesday evening. “John was not just a good priest, he was a great one as tributes of recent days vouch,” Nulty said. Nulty continued that he could not do justice to the number of texts and emails that have poured in since last Wednesday. “The number of messages relayed through social media. And the irony of it all is, that the subject matter in every inbox ‘Father John Cummins’ was very much a slow convert to even the simplest mobile. “John referred to it as a ‘mobility phone’. Of course, rumours abound that he had a mobile for years, a Christmas gift, but he jealously guarded the number,” Nulty joked. 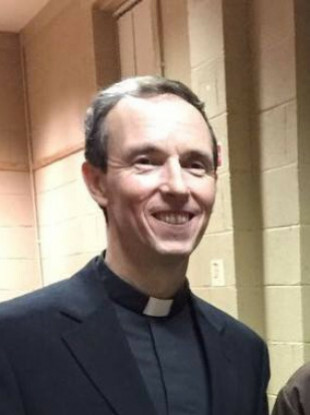 After Cummins became the parish priest in Abbelyeix in 2017, “the luddite was converted” said Nulty. And of course, not only to the mobile, but he turned up to meetings, mostly late mind you, with an iPad under his arm, which he furiously typed on, as the meeting progressed. Father Cummins left his desk in Abbeyleix last Wednesday afternoon with plans to return to complete a Catholic Schools Week liturgy for the students of Heywood Community College the following day. John was gentle, loyal, he was so pastoral, he was the essence of kindness. Father John Cummins was buried in the family plot with his late dad Con who died in February 2003 in Saint Conleth’s Cemetery. He is survived by his mother Renée, brothers Con and Gary and sister Maria. Email “'It feels as if God scored an own goal': Priest who died in accident at Laois parochial house laid to rest ”. Feedback on “'It feels as if God scored an own goal': Priest who died in accident at Laois parochial house laid to rest ”.